The telephone rang sharply at 4:00am. I answered it hesitantly, expecting the worst. What could possibly be so important? That was 20 years ago and thankfully it wasn’t bad news. It was my stepson calling from somewhere faraway on his round-the-world trip. 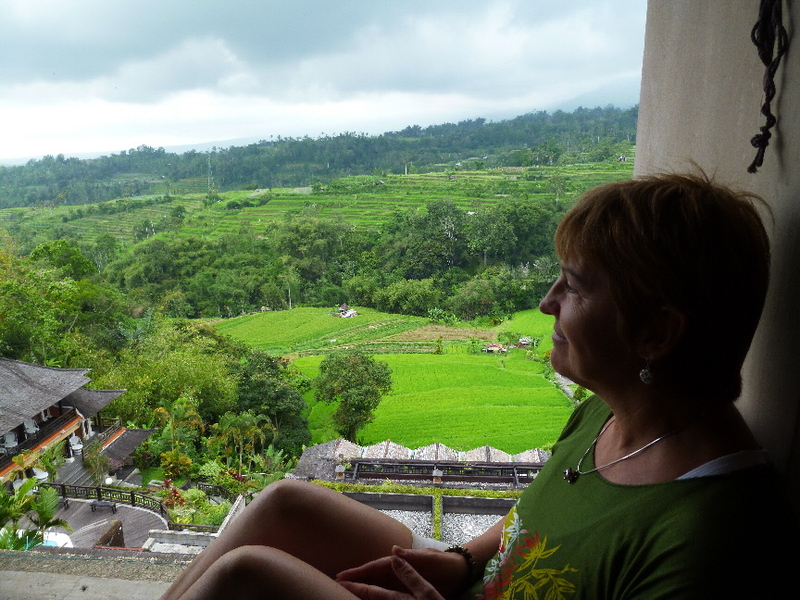 “Sue – I’m in Bali and it is the most beautiful place on earth!” “You MUST visit here before you die”. In case he knew something about my life-expectancy that I didn’t, I responded “OK, quick – tell me more”. For this independent young man to call home with such excitement wasn’t the norm for him, so I knew something spectacular was waiting on the other side of the globe. Fortune smiled on me this November and I found myself exploring the wonders of the most beautiful place on earth. If you love to snorkel, this is heaven. It’s great for beginners too because you can just slip on your flippers and waddle out. This was especially important for me because I had my first snorkeling experience a week before and surprised myself – I was scared! We went on an excursion and the preparation was non-existent. What I expected and the reality didn’t even resemble each other! I found myself in the middle of the ocean with no life jacket and my snorkel on backwards. Not a pleasant experience! This was a great hang-out spot. There was always lots to see, great people watching and inexpensive lawn chairs. And they all come with ‘umbrella service’ – if you want a cold drink, something to eat, a massage, manicure, boat ride… all you have to do is nothing. It will all come to you. But in a un-assuming, non- persistent kind of way. The beach vendors here understand ‘No thanks’. But you can’t say ‘Later’ or they hold that as a contract and return to remind you. Kuta is where the party animals go. Surfers and bikinis abound. There is a lot of action and noise. And the vendors on this beach are very aggressive. They don’t rely on their sweetness to get business, they just wear you down into submission. No means yes. 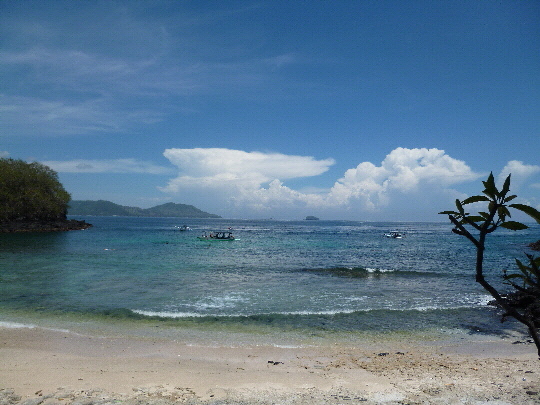 But – the beach is incredible with crystal clear water. And sooooo warm. After sweltering in the 38 degree high humidity environment, escaping to the mountains was just what we needed. 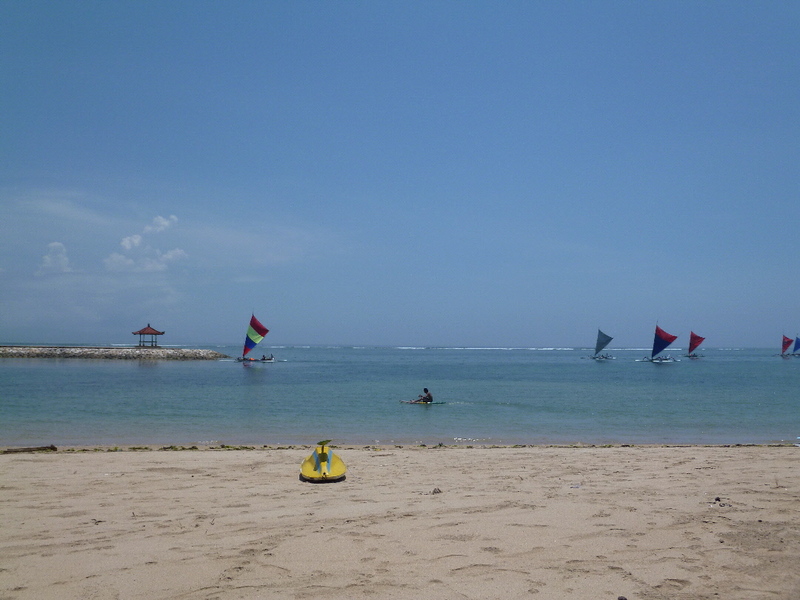 It felt cool here, although 21 degrees celcius is the record low temperature in Bali! The air was so fresh and clean. 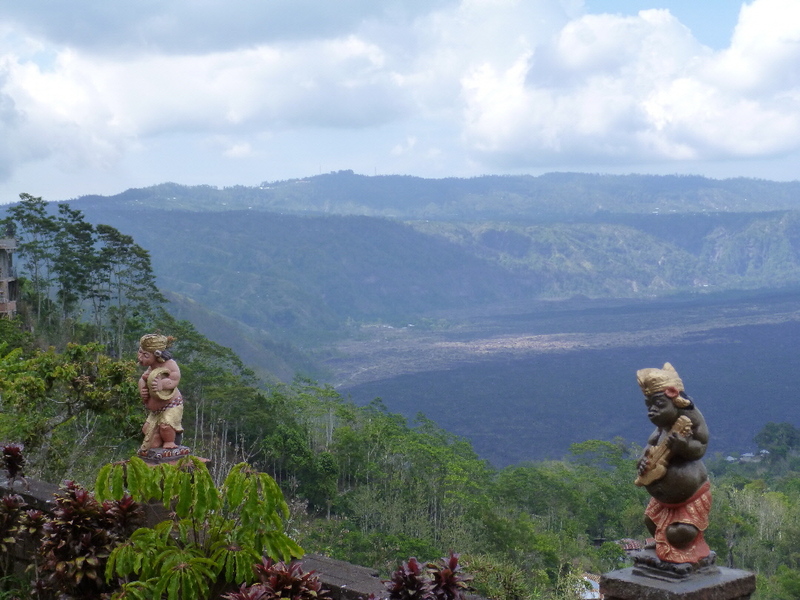 We discovered that these mountains are the poorest places in Bali since there is not enough water to grow rice. Imagine, with that big lake but no water in the hills. There are on-going projects to help the people in the small villages eek out a living. 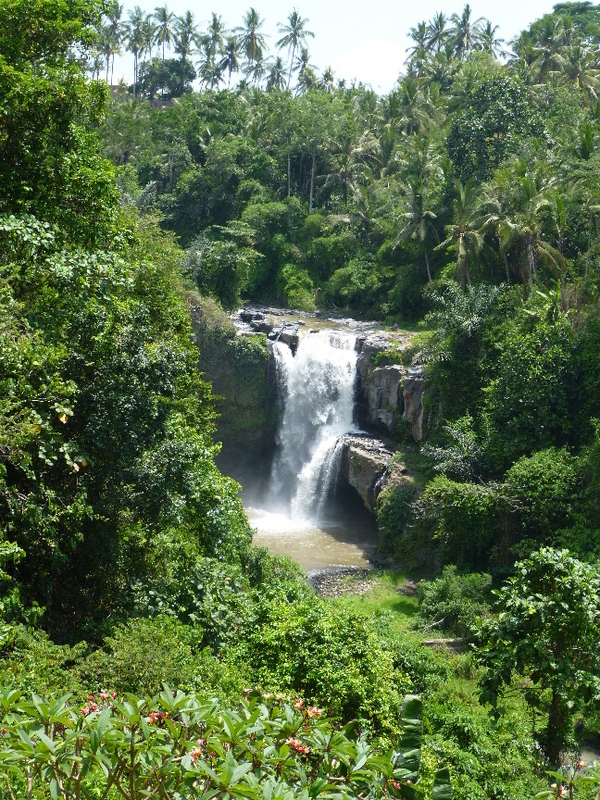 What could be better than a lovely waterfall? Well, picture one surrounded by dense jungle and it takes on a whole new dimension. Everything is just so green. And lush. Colorful flowers speckle the hillside and the roar of the water lulls you into another dimension as good old mother earth in all her splendor delights all of your senses. 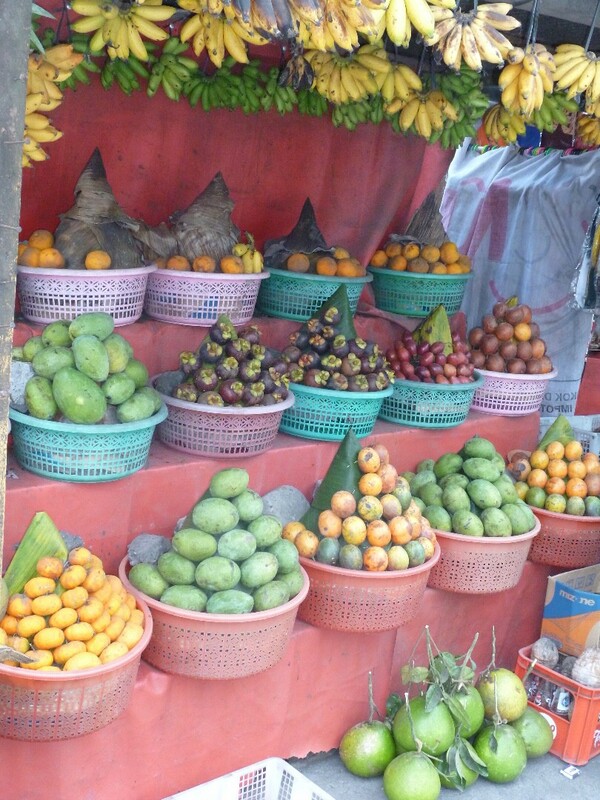 Even the fruit stands are pretty. The colourfulweirdly shaped fruit is arranged in artistic sculptures and even though I had no idea what most of it was, I craved a tropical fruit salad. But I would have to wait since we were on the other side of the island many hours from our hotel home. The lady who was trying to sell this fruit was not happy that I wasn’t interested in buying; she used some words that didn’t sound like she was expressing her love… Then she stomped off. With this bad jiji, I couldn’t possibly eat her fruit now! 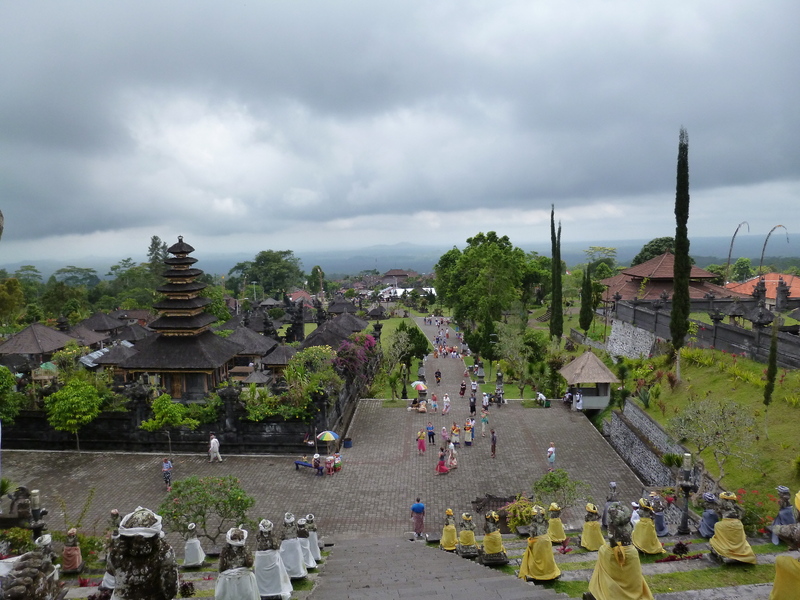 The most important and probably the oldest temple in Bali, it is actually comprised of about 28 temples, making for incredible roofline views. It has wonderful energy in spite of the over-abundance of ‘tourist guides’ trying to take your money for just about anything. It doesn’t matter. Because from the top, you can see forever. And lastly, my favorite – the terraced rice paddies. So rich with life, you can almost feel them breathing.